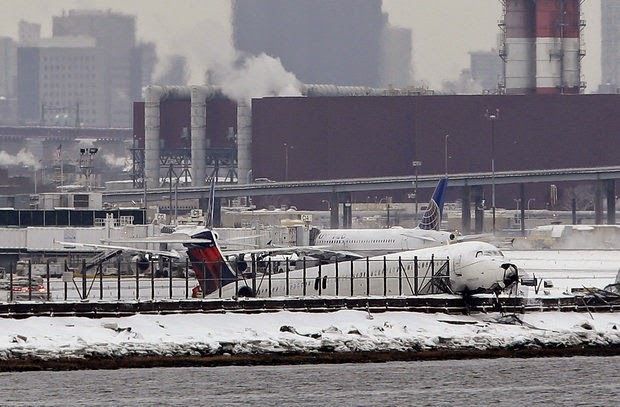 Delta Air Lines Flight 1086 departed the runway at LaGuardia airport on Thursday after landing in low visibility and came to rest on a berm adjacent to Flushing Bay. The MD-88 had arrived from Atlanta at about 11 a.m. with 125 passengers and 5 crew. There were no fatalities or serious injuries and the NTSB has recovered the data recorders and is starting their investigation. My first impression upon seeing the news reports was that the aircraft was extremely lucky to not go into the bay as it appears to have almost done. A few clicks around the web showed that the aircraft had been sliding sideways along the berm and not directly at it, taking the fence with it as seen above. The berm was to the side of the runway and not at the end. Not quite the "roadrunner-coyote cliff hanger" moment it first seemed. That's not to say that this isn't a serious incident. It is. The aircraft is most likely totalled with extensive and hard to repair fuselage damage. The pilots themselves have already been drug and alcohol tested (normal protocol), and can now expect a months long body cavity search by investigators and authorities. Lawsuits have most likely already been filed by some passengers. A search for historical METAR reports quickly returned the weather conditions for the aircraft's arrival time. METARs, or Meteorological Terminal Air Reports are the routine periodic weather observations made at almost all airports with instrument approaches. They are typically released at about 10 minutes prior to the hour but can be issued more frequently if weather conditions are changing rapidly. This can be decoded as follows: First the identification of the type report, then the field identifier KLGA, LaGuardia. The "K" is the country code. The time is listed with the date followed by the "zulu" time or GMT. Since New York is GMT-5, that puts the local time at 10:51 EST, just before Delta's arrival. Next is the wind which is from 010 degrees at 8 knots. On the runway on which they landed, Rwy 13, this is a left quartering tailwind. The visibility is 1/4 mile with the specific visibility for runway 4 listed as between 2800 and 3500 feet. Obscurations to visibility are listed as snow and freezing fog with a vertical visibility showing 900 feet. While the METAR reported the specific visibility for Runway 4, there is also a visibility measuring installation on Runway 13 as well. It is most likely convention that only one is listed in the report. There is no doubt that the tower was reading visibility reports for Runway 13 directly on the radio. The temperature and dewpoint are at -3 and -5 degrees celsius respectively, with an altimeter setting of 30.12 inches of mercury (in. hg.). The rest of the string is more detailed technical data referring to the type of automated sensor package and other details. What does this mean in English? It means the weather was really really crappy. This report is about as bad as it can get with the airport remaining open. Airplanes normally land into headwinds if they can. The reason for this is that a headwind will reduce an airplane's velocity over the ground resulting in less energy to dissipate during the landing. And as the energy carried into the landing varies with the square of the velocity, a slight increase in velocity will result in a large increase in energy that must be absorbed by the brakes and thrust reversers. So this begs the question of why was LaGuardia landing on a runway with a tailwind in snow and ice? The answer is in the visibility. With a reported visibility between 2800 and 3500 feet, the only approach available with low enough visibility minimums was the either the ILS to runway 22 or the ILS to runway 13. The approaches to runways 4 and 31 both have minimums of a mile visibility or higher due to obstacles and other criteria. Of the two remaining approaches, a wind of 010/8 would have been nearly a direct tailwind on runway 22. This left the ILS to 13 as the least worst choice. Given though that the aircraft did not overrun it's landing runway, but rather went off the side may mean that a slight tailwind landing wasn't a factor in this incident. The winds at landing would have been 120 degrees from the left at only eight knots resulting in a tailwind component of only a few knots. The issue of low visibilities necessitating the use of a non-optimum runway in snow was a factor in the overrun and crash of a Southwest Airlines jet over ten years ago. It will surely be looked at by investigators in this incident. Investigators will be sure to focus on exactly where the airplane touched down on the runway. One of the biggest challenges to landing in a low visibility environment is that there is very little time to assess the exact position of the airplane vis a vis the runway before landing. Should the airplane be even just a little bit to the left or right of the runway centerline, there is very little ability to make a correction in the short time between decision height and touchdown. In extreme conditions such as landing just above minimums, determining if a correction even needs to be made can be a challenge. There have been instances in the past of pilots mistaking runway edge lights for the centerline lights and placing the wrong row of lights right between the gear. Of course this would leave one of the landing gears off the runway in the dirt. This difficulty can be compounded by a crosswind as existed at LGA. As an aircraft travels down final, it will naturally windmill into whatever crosswind exists. The angle between the aircraft heading and the runway heading is known as the drift angle, and can be disorienting especially in a low visibility approach. When the aircraft is "drifting" or "crabbed" into a crosswind, the runway will not appear directly in front of the cockpit but will rather be off to one side or the other when breaking out of the weather. Pilots must know where to look for the runway in the windscreen by accounting for the drift angle. Another potential error during a very low visibility approach is known as the "duck under". All "precision" approaches, and by that I mean approaches with glidepath information included, will have what is known as as "decision height", or "decision altitude". It means just what it says. We fly down the glidepath in the weather until reaching that altitude and then make the "decision" to land or go around. There are very specific criteria of what must be in view in order to continue an approach after decision height. While the runway needn't be seen, the approach lights must be in view for instance, and the aircraft must be tracking on centerline. The red runway stop bar lights must be seen to continue below 100 ft above the runway as well. I could go on for several paragraphs about all the specific requirements needed to be met to continue to a low visibility landing. If at any time all requirements are not met, a go-around is mandatory. The temptation in a low visibility landing is to go in the direction of the things you see which are below the aircraft. It's a natural tendency but must be resisted. A "duck under" may carry the aircraft below the glideslope and result in a short landing. Therefore, once visual clues become available, pilots must still reference their instruments inside the aircraft to maintain an appropriate glidepath to touchdown. This requires using a hybrid inside-outside scan during landing which can be disorienting. It is here that the pilot not flying earns his keep by staying on instruments and calling out deviations. Ok, let's assume that the approach and landing were uneventful. Assuming that the aircraft touched down on centerline and in the landing zone (first 3000 feet), what could then go wrong? Plenty. Investigators will be sure to look at the wheels, tires, brake assemblies, anti-skid systems and thrust reversers. A malfunction of any of these could cause some adverse drag that might cause the aircraft to drift laterally on rollout. Ideally, rudder application or differential braking should be enough to return the airplane back onto centerline if it strays. As the aircraft speed decreases however, the rudder becomes less effective and the captain must at some point transition from the rudder peddles to the tiller (steering wheel) to maintain lateral control or take control from the first officer. This typically happens around 60 kts or less. I say captain here because most airplanes have only one tiller on the left bulkhead for use by the captain. While LaGuardia airport authorities were quick to take to the airwaves to declare that the runways had just been plowed, often the entire width of the runway may not be plowed. Should an airplane drift for whatever reason towards the side of the runway and get into a snow covered area, nose wheel and braking effectiveness can rapidly drop. And this may happen just as the aircraft decelerates below the point of rudder effectiveness. We've all been driving on a snowy road following where all the other cars have been making a path, but know that when pulling onto the shoulder all bets are off. During times of inclement weather, airports will announce that "braking action advisories" are in effect. When this happens, all pilots are required to report what the braking action was like on landing. We use terms such as "wet-good", wet-fair", "wet-poor" or "nil". A report of "wet-poor" or "nil" pretty much stops all operations. Arrivals just prior to the incident had been reporting good braking action, and there's no doubt that investigators will also be looking closely at all reports and the specific areas of the runway that had been plowed. As far as airplane accidents go, this one will eventually be forgotten by the public at large. No one was hurt and while the airplane is probably a loss, the MD-88 fleet is old and probably scheduled for retirement in the near future anyway. In the best of all possible worlds, if the pilots are found at fault for continuing an approach which should've been abandoned, perhaps they'll get some time off and some retraining before flying again. Should the cause end up being a mechanical problem, then records and procedures will be reviewed to ensure compliance. Perhaps inspection schedules will be adjusted. Flying an approach in minimum visibility, in an old airplane, to a short runway bordered by water, in a tailwind is probably as bad as it gets in modern aviation. There is simply very little room for any error. It may not be a surprise that this type of accident happened, but rather that it doesn't happen more often.